Fillmore: "I tell ya, man... every third blink is slower." Sarge: "The sixties weren't good to you, were they?" It's a funny quote from the movie Cars, but over in Cars Land, the third blink of the yellow light really is slower! Just stop and look next time! It's not hallucination--the Imagineers really did program this little quirk of the traffic light as a little "easter egg" for sharp eyed fans looking at the details. I love that Cars Land has little touches like this, and it's part of why Disney California Adventure has really transformed into an amazing park! 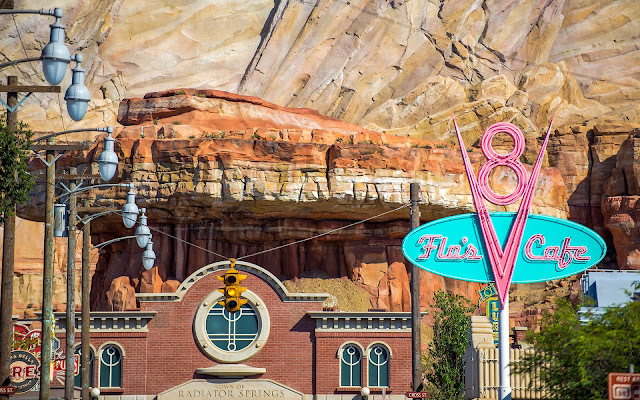 The blinking traffic light at the main interaction at Radiator Springs really does blinks the way it does in the movie.